The HiloEntrySignals indicator is designed to detect favorable conditions for entering a trade. 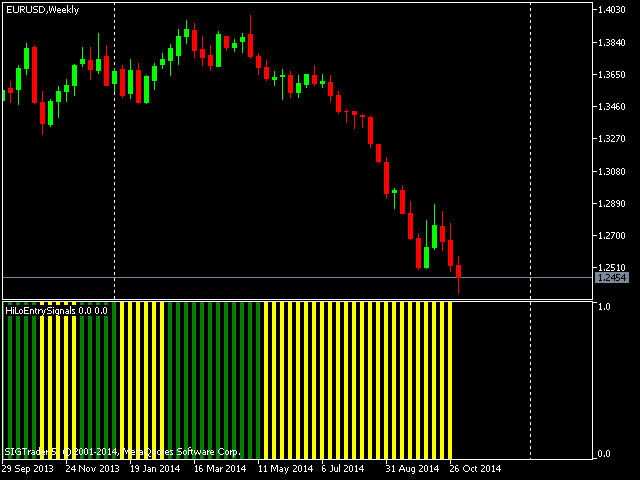 Buy signals are shown by a green bar and sell signals are shown by a yellow bar. The indicator generates signals by identifying areas of congestion, followed by a breakout that signals the new direction of the price after a making a possible high or low. The indicator does not redraw at all. Input parameters: Min and Max represent the minimum and maximum number of bars from the current bar that the indicator will evaluate as it identifies areas of congestion. The Lookback value is the number of bars the indicator will be drawn for. If the indicator does not draw anything and an alert is triggered, that means that there are less bars on the chart than the Lookback back value specified. The indicator has performed best on higher time frames like the daily and weekly time frames, generating high probability trades, with a win rate of between 70% and 80%, depending on the asset being traded, these results are based on historical testing. The indicator can be used on lower time frames like the 5 minute chart for scalping, when scalping it is recommended to filter trades by taking into consideration significant areas of support and resistance. Always make sure that there is enough room for the price to move between key historical resistance and support levels. On lower time frames there will be a larger number of signals generated and therefore more false signals. Simply buying and selling on every signal on charts with a lower time frame than 4 hours is not recommended . An example of a simple exit strategy is to use carefully determined take profit and stop loss levels. Ascertain how much you are willing to risk, when a signal is triggered and the difference between the last swing high or low and the close of the signal bar is within or equal to your risk appetite, open a trade. 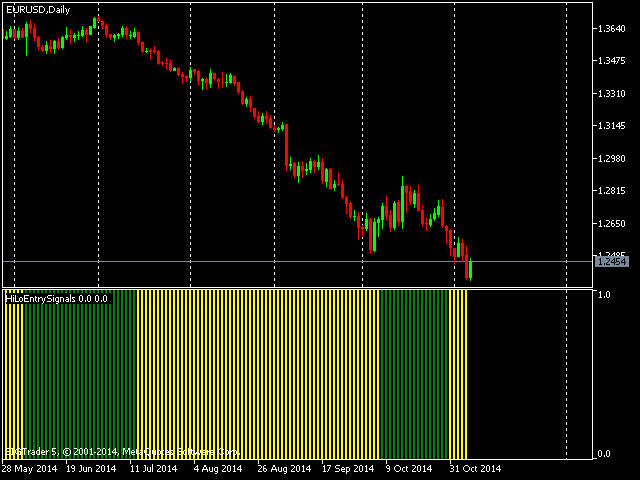 Take profit at a key resistance or support level. If you want you could scale in your trades as the price breaks through important price levels, in order to take advantage of a strong moves. Please remember that is not advisable to use this indicator for exiting trades, it is strictly for entry identification only. Added alert and email notification options for signal changes.